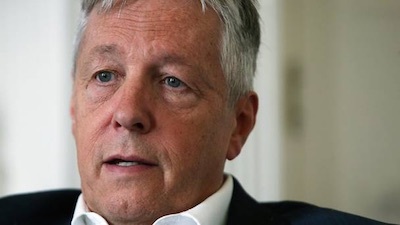 The DUP leader Peter Robinson has offered to take part in a fresh round of multi-party talks as a deep crisis over allegations that the Provisional IRA still exists appears set to extend over a period of weeks or months. The talks will involve input from the Dublin and London governments and will also include a new attempt to break the deadlock over last year’s unimplemented Stormont House Agreement. While the status of the political institutions in the North remains under threat from the DUP following the withdrawal of the Ulster Unionist Party, it now appears unlikely that a suspension or collapse will take place ahead of the talks. Last week, the UUP said it could no longer work with Sinn Fein because trust had been “shattered” over claims that individual members of the Provisional IRA had been involved in the killing last month of Kevin McGuigan, suspected of being behind the ‘grudge’ murder of top Provisional IRA figure Jock Davison last May. The DUP briefly considered withdrawing from the Executive, but now says it wants to see Sinn Fein excluded rather than see the Executive collapse. The party has urged the British government to suspend the Stormont Assembly while negotiations take place, something which nationalist parties have refused. While appearing to rule out a suspension, the call for fresh talks was met with a positive response from the Dublin and London governments and the other parties. However, Alliance leader David Ford expressed concern over the “seemingly endless cycle of crisis after crisis”. The escalating conflict between the two main unionist parties, the UUP and DUP, was at the centre of this week’s events. In the latest twist, Lisburn councillors Jenny Palmer and her husband John rejoined the UUP after twelve years in a move that was seen as a morale boost for Mike Nesbitt’s party. Mrs Palmer had quit the DUP after claiming she had been bullied for blowing the whistle on the DUP’s efforts to influence the outcome of a contract. The DUP’s Arlene Foster defended the party from the UUP’s new hard line on working with Sinn Fein. She said the UUP’s attitude to the present crisis had echoes of the party’s actions in the years following the Good Friday Agreement, and condemned the UUP’s refusal to back a suspension of the Assembly. Mr Robinson, who has been on holiday, branded the UUP decision to quit the Executive as irrational, illogical and based on “political expediency” rather than principle. Walking away should be a last resort, he said. “This is not the time to flee the battlefield, it is the time to confront violent republicanism, to stand and fight for democratic principles and to do what is right for the law abiding citizens of Northern Ireland,” said Mr Robinson. He said he accepted a police “assessment” that PIRA members were involved in the murder of Mr McGuigan and that some PIRA structures remain in place. Such activity is inconsistent with membership of the Executive, he said. “The UUP position is just incorrigible. Meanwhile, Sinn Fein accused its political opponents of cynically exploiting the recent killings. It also accused the UUP of hypocrisy over its united front on parading with the political spokesmen of the two most active loyalist paramilitary groups. Sinn Fein’s Martin McGuinness said his party had a strong record of condemning violence and said those who engage in violence are “no friend of Sinn Fein”. He described the killers of both Kevin McGuigan and Jock Davison as “criminals” and “violent dissidents”. Speaking from Stormont Castle, the Deputy First Minister said any republicans engaging in violence “immediately become the enemy and they become dissidents”. He said the UUP action was “all about the election” and said if the DUP left the Executive it would show a “massive failure of leadership” which would create a “very real prospect of an increase in violence on our streets”. “The only way we can defeat those people is by working together and be seen to work together,” he said. Meanwhile, the US administration has urged Stormont politicians to seize the “opportunity” presented by the new round of talks. Retired Senator Gary Hart, who represents Secretary of State John Kerry, said the US remained “actively engaged” and would continue to support the process. But the DUP has insisted that Stormont must not operate on a ‘business as usual’ basis and Peter Robinson has threatened that ‘unilateral action’ could be taken. In a foretaste of what might be planned, DUP councillors on Belfast City Council moved to temporarily overturn a decision to fund former prisoners’ groups. Sinn Fein councillor Jim McVeigh said that community groups should not be punished in the political fall-out over Mr McGuigan’s murder. He said the funding had not only been ear-marked for ex-prisoners groups but also victims groups, and had “become a victim of the electoral battle” between the DUP and the Ulster Unionists. “Republicans weren’t involved in the killing of Kevin McGuigan but we don’t believe that community groups should be penalised,” Mr McVeigh said.